Today I’m sharing a chocolate recipe with you. 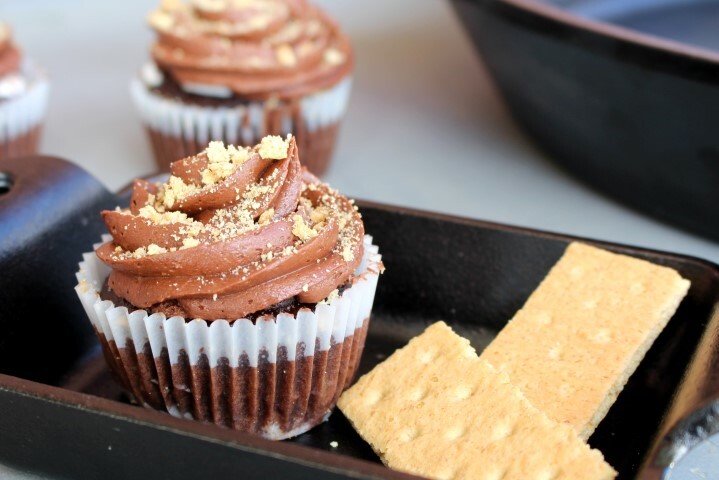 Did you know the last recipe with chocolate I shared was in December? It was this Chocolate Peppermint Cheesecake if you’re wondering. I also shared these White Chocolate Snickerdoodles with you this spring, but I’m not sure white chocolate counts chips count. Did you forget I even posted chocolate recipes? I hope not, I named my blog after chocolate and After months of bread recipes, rhubarb and other fruit desserts and a few good main dishes. I’m excited to be back with a real chocolatey recipe! 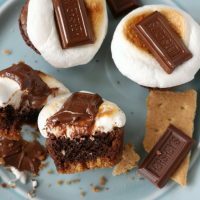 Introducing S’mores Brownie Bites. This needs to be your go-to summer dessert recipe. Need to bring something to a potluck? Make these. Need a snack for all the kids swimming in your backyard? Make these. Packing food for a camping trip? 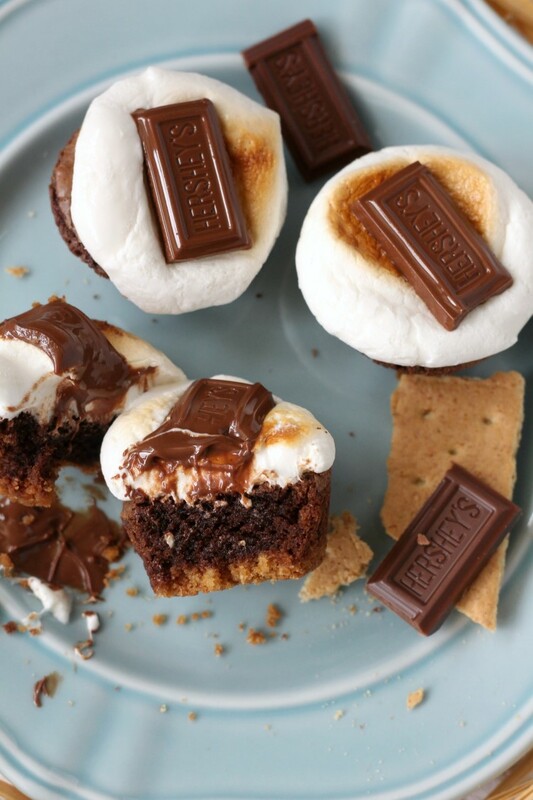 Pack these instead of traditional s’more ingredients. 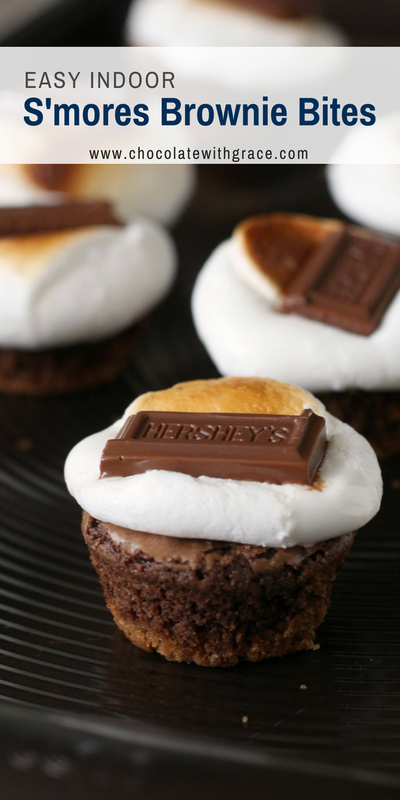 Have a late night chocolate craving? 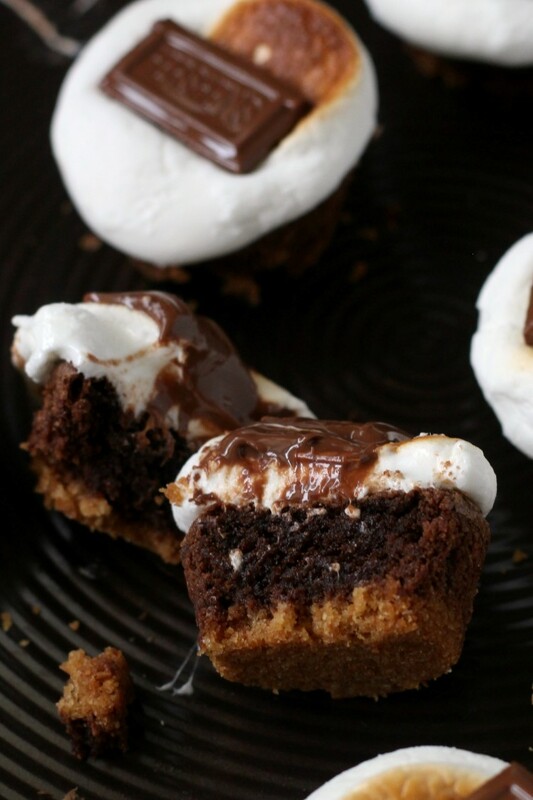 Make these S’mores Brownie Bites. Perfect for every occasion! Who gets excited about a classic graham cracker, marshmallow, Hershey’s chocolate s’more? I like a good one made with a toasted, melty marshmallow. (If the marshmallow is still hard inside though, forget it.) 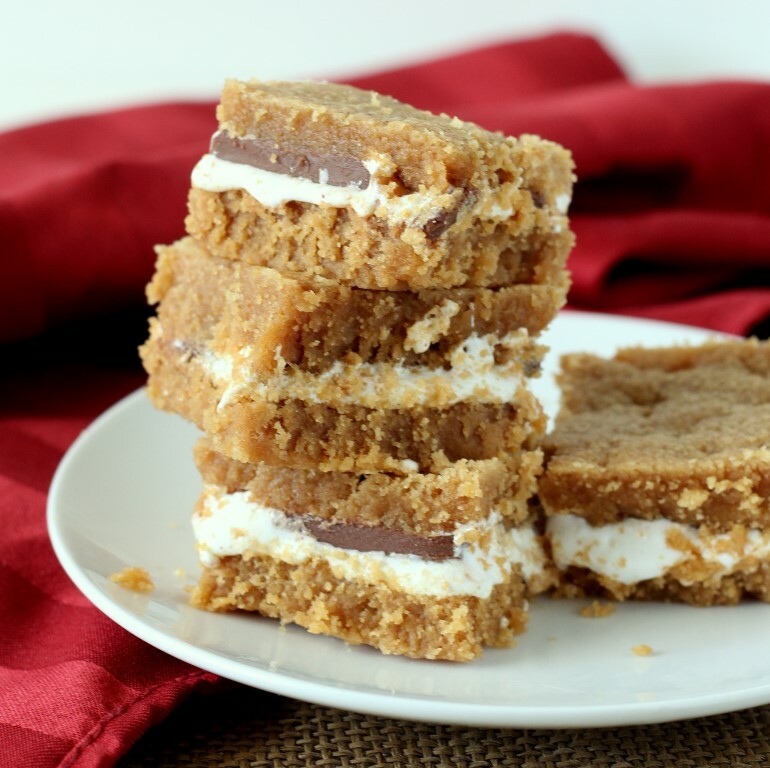 But a regular old s’more isn’t something I crave, the graham cracker gets a little dry for my personal tastes. Now pair all those flavors with a rich brownie and you’ll have something I’m craving every night for dessert. I love the the s’mores flavors, but variations on the traditional is what gets me excited. 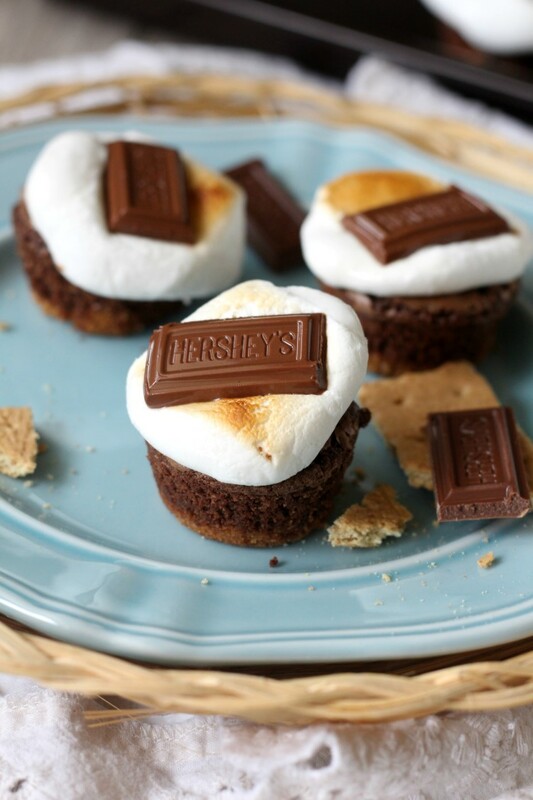 Tell me all your favorite ways to make a s’more. 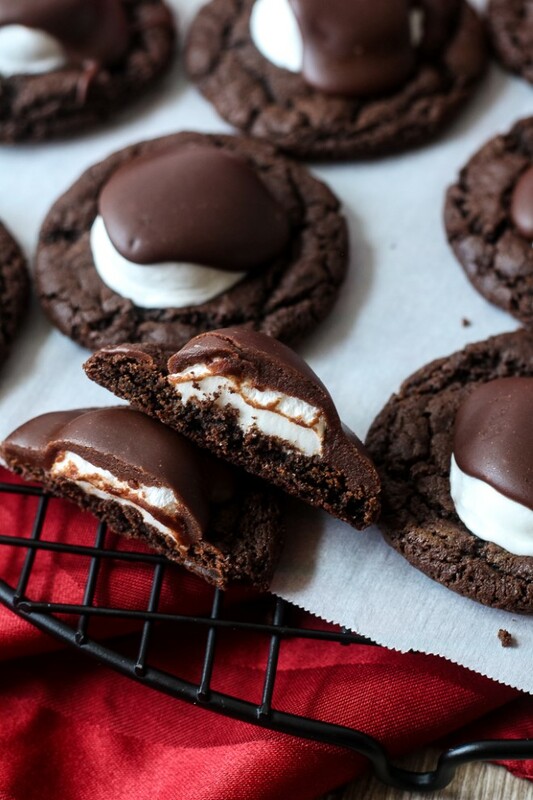 After I made these, I put them in the freezer and then every night after supper, I would take one out and microwave it on low until it was thawed and the marshmallow was gooey. Mmmmm. To make these ahead, you can either make them entirely and then freeze them for up to a few weeks. Or you could make the graham cracker and brownie portion and leave them tightly covered on the counter for a day or two. When you’re ready to serve them, top with a marshmallow and pop them under the broiler for a minute or two until toasted and gooey. Add the chocolate and you are ready to serve. 3/4 cup graham cracker crumbs, about 6 sheets. Preheat the oven to 350 F. Combine the crushed graham cracker crumbs, melted butter and sugar. Grease your mini muffin tins. This recipe makes 24 brownie bites. Press a scant 1 tablespoon of crumbs into the bottom of each muffin tin. Set aside. Whisk together the butter, oil, sugar, eggs and vanilla in a large bowl. Add the cocoa powder, flour salt and baking powder. Stir till combined. Divide the batter between the muffins cups, it will be around 1 1/2 tablespoons brownie batter per muffin. Bake at 350 F for 11-13 minutes or until just set. Don't over bake. Let cool and remove from the muffin tins. Turn on the broiler in the oven to preheat. 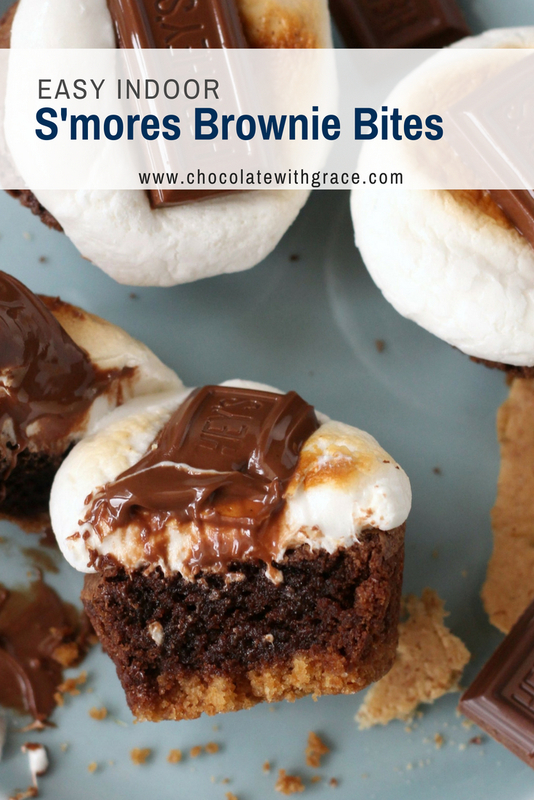 Place the brownie bites on a cookie sheet at least 2 inches apart. Place a marshmallow on top of each. Put them under the broiler for a minute or two until the tops are toasted. Watch them closely, they burn quickly. 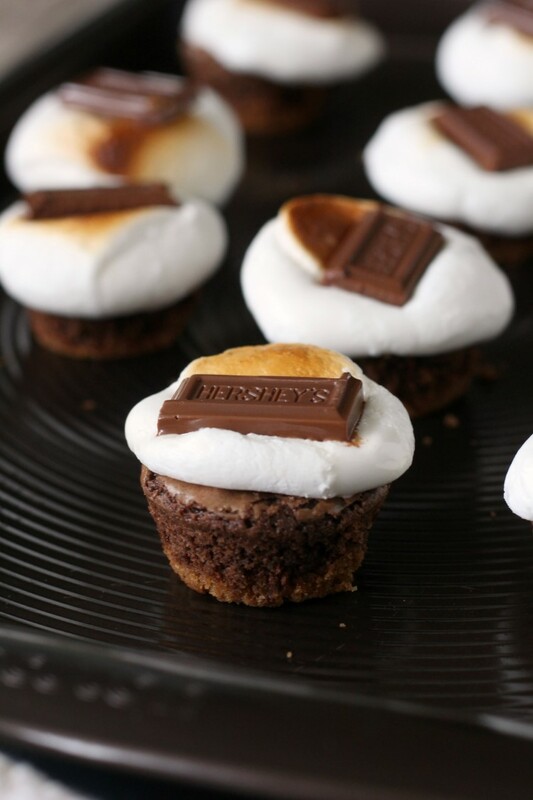 Remove from the oven and press a rectangle of hershey's chocolate on top. They are best served warm. 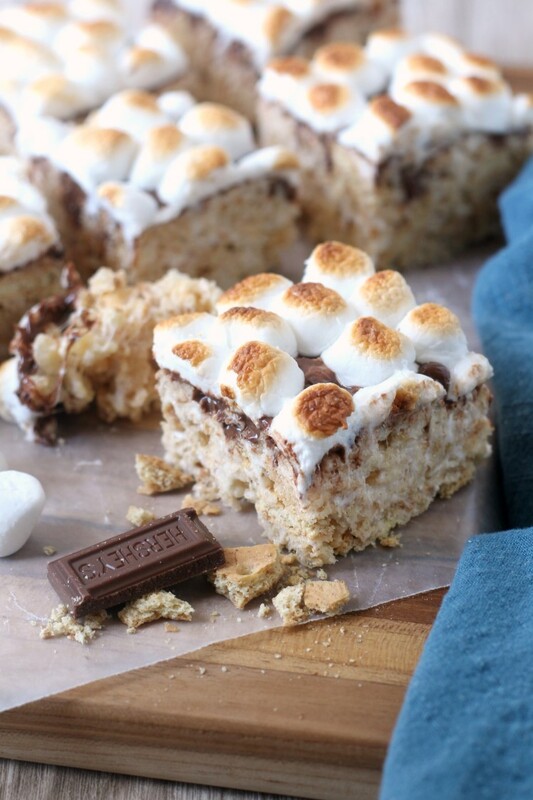 If you’re looking for over-the-top s’mores recipes that go beyond the campfire. He are some to check out. 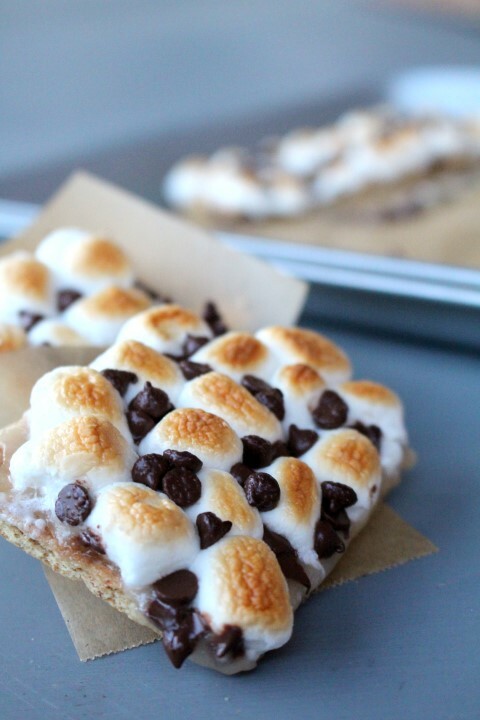 Grilled S’mores Pizza from Dessert Now! Dinner Later!